Season the shins with salt and pepper and dust with the flour (on both sides). Heat up a couple of tablespoons of olive oil in a large pan and start gently frying the shins until they turn golden on both sides. Remove the shins and add the chopped vegetables into the pan and saté for about 5 minutes until the onions turn translucent. Now add the wine and let it cook until almost totally evaporated. Stir in the tomato purée and after that put the shins back into the pan. Cover with the prepared veal stock, add the bouquet garni along with the crashed garlic clove. Bring to the boil, lower the heat down and simmer on a very low heat for about 2 – 2.5 hours until the meat turns very tender. Mix all the ingredients for the gremolata together. Once you have served your osso buco on a plate, sprinkle it on top of the meat. 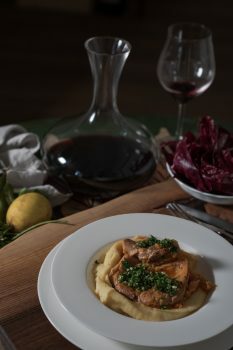 Serve osso buco with a potato purée (with parmesan cheese, the recipe is below) or saffron risotto. Roast the bones for 60-90 minutes in the oven preheated to 180 C.
In a large pot heat up a few tablespoons of olive oil, add the vegetables cut into chunks and fry for a couple of minutes. Add the tomato paste and the spices. Next put the roasted bones into the pot and cover with cold water. Bring the stock to a boil and lower down the heat. Simmer for minimum of 4 hours skimming the surface with a ladle when necessary. Put the mashed potatoes back into the sauce pan and gradually add butter, the warm milk and grated parmesan while stirring continuously. Season, taste and add more salt if needed. If the purée is too firm stir in more milk. Serve warm.